Workforce today articulates more about their needs. Employees desire the best of everything – competitive salaries, comfortable and inspirational lifestyles, job security, career enhancement options, work-life balance, and so on. Competition for talent is ever increasing and organizations need to have well-defined philosophies and strategies to help them develop innovative ways of tapping intrinsic motivation of employees by engaging their hearts and minds. While many organisations are struggling to make sufficient progress in this direction, there are organizations that have institutionalized robust practices and effective processes in different people practice areas that go a long way in positively impacting employee perception. In this regard, two types of rewards are identified, and they are intrinsic reward and extrinsic reward. Extant research showed that reward can affect job satisfaction and thereby employee performance, so this study proposes a new framework based on mediating role of job satisfaction. India’s Best Companies for Rewards and Recognition was conceptualized to recognize companies who are leading the way in the area of Rewards and Recognition for us learns from. Human resources are the most important among all the resources an organization owns. To retain efficient and experienced workforce in an organization is very crucial in overall performance of an organization. Motivated employees can help make an organization competitively more value added and profitable. The present study would be an attempt to find out the major factors that motivate employees and to show relationship among reward, recognition and motivation while working within an organization. The data were collected from employees of diverse type of organizations to gain wide representation of sectoral composition. The participation in survey was voluntary and confidentiality of responses was ensured. The statistical analysis showed that different dimensions of work motivation and satisfaction are significantly correlated and reward and recognition have great impact on motivation of the employees. Implications of the study for managers and policy makers in the context of human resource practices have been discussed. Limitations and guidelines for future research are also provided. A meta-analytic review of all adequately designed field and laboratory research on the use of incentives to motivate performance is reported. Team-directed incentives had a markedly superior effect on performance compared to individually- directed incentives. Water as a basic human need is a limited natural resource and is very precious in nature. It is estimated that among 1360 million cubic kilometres available, only 0.2 million cubic kilometres is fresh water. In Kerala, 85 percent of drinking water needs are met from ground water. In recent decades human demand and misuse of water continuously increased and shortage of water is a global issue. The careless usage and less availability of water indicate the need for water literacy among people. 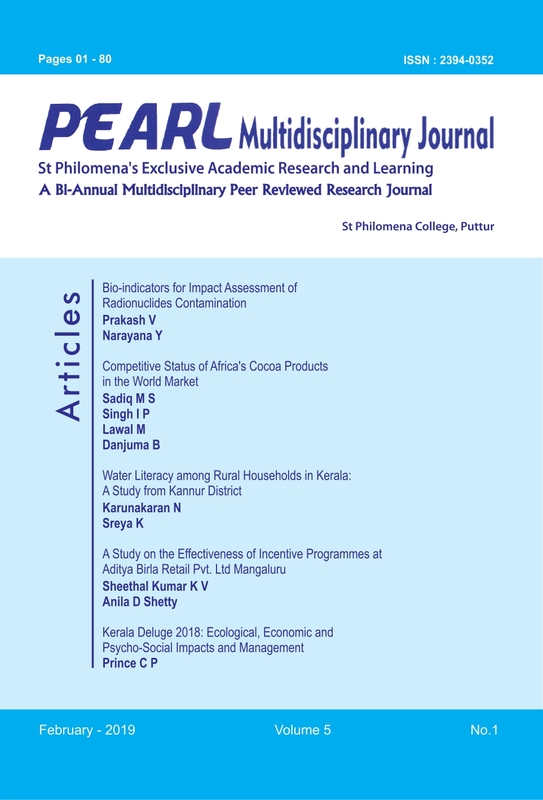 The study revealed that rural households in Kerala are highly water literate and they ensured environmental sustainability as their responsibility. To formulate efficient and articulated future cocoa policy prescriptions, and ensure the continuous contribution of the subsector to poverty reduction, income generation and growth of Africa’s agricultural sector, the present research empirically examined the global competitiveness of Africa’s cocoa export during the spanning period of 2000-2013. The used dated data were sourced from FAO and UNCTAD databases. Export trends and indices of the revealed comparative advantage, as well as Trade Mapping (TM), were examined for cocoa beans, cocoa butter, cocoa paste and cocoa powder/cake. Empirical findings showed that Africa has only revealed comparative and competitive advantages in the exportation of cocoa primary product and disadvantage in the comparative and competitive status in the exportation of its secondary cocoa products. Furthermore, Africa is among the winner group with it controlling a large chunk of the market despite the decline in the export market of cocoa during the studied period. Hence, in order to enhance Africa’s relative comparative and competitive advantages in the exportation of cocoa products and its continuing presence in the world markets, Africa should improve on the quality of its cocoa products keeping in-view the best marketing grade and standardization for cocoa products in the global market. Also, Africa should invest more in post-harvest technologies to have a breakthrough in the secondary sub-sectors of cocoa via value addition, thus increasing its global share in the market which in turn would enhance its foreign exchange earnings from the exportation of cocoa. The activity of important radionuclides 232Th, 226Ra and 40K were analysed in twelve medicinal plants collected from Mangalore and surrounding region by gamma spectrometry. The activity in the representative soil sample is also measured in order to study the transfer of radionuclides from soil to plant. In plant the average values of 232Th, 226Ra and 40K activity were found to be 0.8 Bqkg-1, 5.0 Bqkg-1 and 37.1 Bqkg-1 respectively. In soil the average values of 232Th, 226Ra and 40K activity were found to be 54.7 Bqkg-1, 64.2 Bqkg-1 and 384.3 Bqkg-1 respectively. The average values of transfer coefficient for 232Th, 226Ra and 40K were found to be 0.02, 0.08 and 0.10 respectively. The 232Th activity was below detection level for most of the plant samples, though the activity was significant in soils associated to these plants. The significant activity of 226Ra in both plant and associated soil shows the higher root uptake of this radionuclide from soil. All the plants and associated soils showed significant 40K activity. The plant Mamia suregia showed higher transfer coefficient for all the three radionuclides. The plant can be used as bioindicator for the future monitoring of these radionuclides. The absorbed gamma dose rates prevailing in the study area were also measured using portable scintillometer. The results of these systematic investigations are presented and discussed in this paper. Job satisfaction is the end feeling of a person after performing a task. To the extent that a person’s job fulfils his casual needs and in consistency with expectations and values, the job will be satisfying. The feeling would be positive depending upon whether need is satisfied or not. Job satisfaction and occupational success are major factors in personal satisfaction, self-respect, self-esteem, and self-development. To the worker, job satisfaction brings a pleasurable emotional state that can often leads to a positive work attitude. A satisfied worker is more likely to be creative, flexible, innovative and loyal.For the organization, job satisfaction of its workers means a work force that is motivated and committed to high quality performance. Hence this paper examines the job satisfaction levels of employees provided by the factory and it examines the ways of promoting the job satisfaction of employees. The population for the study consists of employees of CAMPCO Chocolate Factory, Puttur. 50 respondents were taken for the study. The technique used for the study is simple random sampling technique. Primary and Secondary data available also made use for the study purpose. The results show that there is significant amount of job satisfaction among the employees of CAMPCO. Fermat’s Last Theorem is one of the most difficult and famous problems in mathematics which was unsolved for more than 350 years. Fermat himself proved the theorem for the case n=4. Leonardo Euler gave the proof for the first odd prime number 3. But his proof was not complete. It contained a fallacious argument which he didn’t recognize. To correct it by the most direct method, that of supplying an alternative proof of the statement for which Euler’s proof is fallacious is not at all simple. Here in this paper we show how the proof can be corrected in a less direct way by bringing in arguments which Euler used to prove other propositions of Fermat. Thus we get a complete proof of the theorem for the case n=3. The social protection to the working class people plays crucial role in the time of accidents; mishappenings and at the time of old age. A country will develop when it has more productive labours. When it comes to the labour welfare and development, the social security scheme stands first. Government has launched many social security schemes but it focused only on organized sector workers in reality. From the decade, major portion of unorganized sector workers are denied by the basic social security schemes like PF, ESI, gratuity etc. Many attempts were made by the various Governments to overcome this problem. Keeping this in mind Government of India has launched JAN SURAKSHA scheme under Financial Inclusion Programme in 2015. The three social security schemes like PMSBY (accidental benefit scheme), PMJJBY(Any type of death compensation scheme) and APY (old age pension scheme) were introduced by the government in order to give social protection to the unorganized sectors of India. The study is conducted in Peraje village to know how these schemes obtained and reached to the unorganized sector workers of the village. The purpose of my research is to create awareness and to evaluate the performance of proposed social security schemes like PMSBY, PMJJBY and APY scheme in Peraje village of Madikeri Taluk. The paper titled “FACEOPEDIA”- A High speed face recognition system using DCT RBF Neural Network is designed to identify the face. There are number of algorithm proposed to do the task of face recognition. The face recognition is one of the most trending and new research area where several research activities are taking place. The face is composed of a complex structure; it varies from person to person. There are several applications regarding the face recognition, they are: attendance system, door opening system, authentication system etc. In this project we are using Discrete Cosine Transform (DCT) algorithm along with the Radial Basis Function Neural network. The neural network is needed to identify the complex facial architecture present in the face. The DCT will reduce the dimension and also extracts the essential features of the face. Beedi rolling has a very important role for rural people especially women. This is generally done by poor households in backward areas where the workers have usually no other means of sustainable employment. It is because of the beedi many rural people have been benefited and improved their condition. To support the beedi workers the government of India has launched programmes like scholarships for their children, providing bonus to the workers, health cards, PF and gratuity. In this context, through this paper a small effort has been made to know the socio-economic condition of beedi workers in Puttur taluk. The study is conducted in Puttur taluk to know how the beedi workers are benefited by these schemes. The purpose of this paper is to create awareness among rural people and to know their socio- economic condition. Have a paper to submit?